Today’s special guest is novelist Travis Haugen. 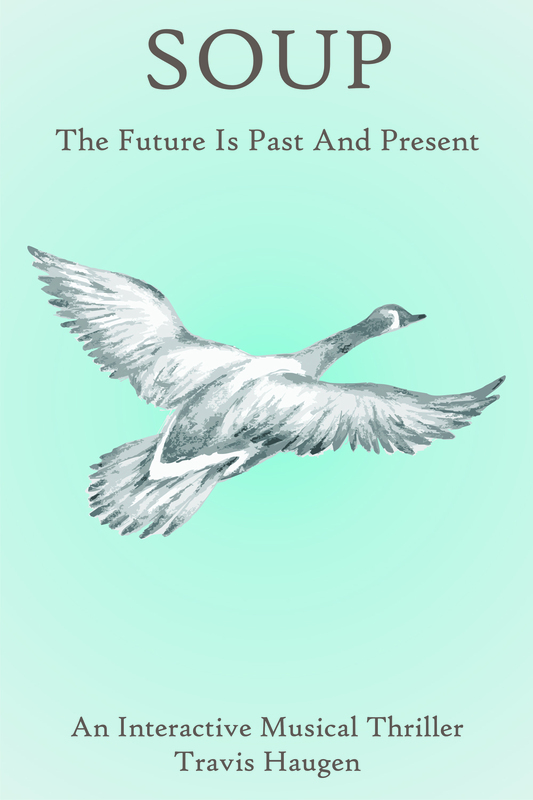 He’s here chatting with me about his new mystery thriller, SOUP: The Future Is Past and Present. During his virtual book tour, Travis will be awarding a $30 Amazon or Barnes and Noble (winner’s choice) gift card to a lucky randomly drawn winner. To be entered for a chance to win, use the form below. To increase your chances of winning, feel free to visit his other tour stops and enter there, too. Travis was born and raised in the prairies of Saskatchewan, lived in Calgary for over 25 years and presently lives in Winnipeg, Manitoba. Travis Haugen has spent forty years of his life touring on the road as a musician and has spent hundreds of hours in recording studios. Travis spends much of his time writing songs, writing stories, playing music and spending valuable time with his family and close group of friends. Welcome, Travis. Please share a little bit about your current release. The story spans 20 years from 2001 to 2021. It is the continuing story of the second generation of the Yonge family. They are a family in search of themselves while dealing with the premature death of their musical father. They find that answers come hard in this period of political unrest, an unrest that contributed to their father’s demise. Music. The writing of one song in 2001 started the process that led to SOUP. The melancholy sound of lonesome piano blues wakes Michelle from a restless sleep. She throws on Scott’s old faded black and white striped cotton robe and makes her way through the darkness to the living room. She takes her place beside him on the piano bench, his face partially lit by a solitary low wattage lamp sitting to the left, on the mantle of the old antique acoustic piano. He shows her a sad smile and continues playing an old blues tune she can’t place, but knows she’s heard somewhere before. “Scott, are you okay?” she asks. He stops and turns to face her, patting her bare leg. “I’ve been better,” he replies with a wry grin. My niece, Candy, and I, are working on bringing the second book in the ‘One Song’ series, Hedley, from the editing stage to the publishing stage. We are also working on music and prose for the 4th book in the series, so stay tuned. I have been writing songs since I was 15 years old. Writing one particular song on one particular lonely night in late 2001 led directly to me writing the ‘One Song’ series. When I write, I write full-time. Once I start writing, it flows and flows and flows until it stops. However, I also work as a computer consultant, play in numerous bands, do session work at ‘Bedside Studios’ in Winnipeg, and conduct philatelic on line auctions for ‘Bow City Philatelics in Calgary, Alberta. So, you can see, when the writing urge hits me, my life is not busy at all, lol. This is why Candy has become invaluable to me in this process, we are a team. I do most of my writing while I am not writing. I have not driven since 1980 because of my eye sight. I get around, snow, rain or shine 365 days of the year on a bike. I do most of my writing, be it music or prose, while I am riding. When I get home, I sit down to a piano or a guitar for the music, or a computer for the prose and I put down what came to me during the day. If you are an e-book reader, I strongly recommend this format for you. The links to the music are embedded in the book so the music is a simple click away. If you prefer the hard copy, the interactivity between the music and the website is a simple thing. Instructions are in the book itself on the very first page on The Note From The Author. I hope you enjoy our Interactive Musical Thriller. Novelist Richard Armstrong joins me today and we’re chatting a bit about his new comedy crime thriller (aka, a ‘caper’), The Don Con. The Don Con tells the story of a washed-up actor who hit the high watermark of his career when he played a bit part as a gangster in The Sopranos. Now he makes a meager living signing autographs at pop-culture fan conventions. 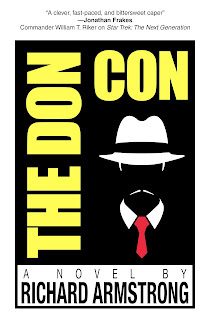 The Don Con is a pure entertainment caper novel with all the intrigue of Ocean’s 11, as well as a clever pop-culture satire that riffs on The Sopranos, Star Trek, and The Sting. I have an old friend who was one of the main actors in Star Trek: The Next Generation. My wife and I had dinner with him one night and he regaled us with funny stories about signing autographs at Star Trek conventions. (Until then, I didn’t know such things existed!) Among other things, he told us how much cash he brings home after one of these autograph sessions, because it’s still mostly a cash business. 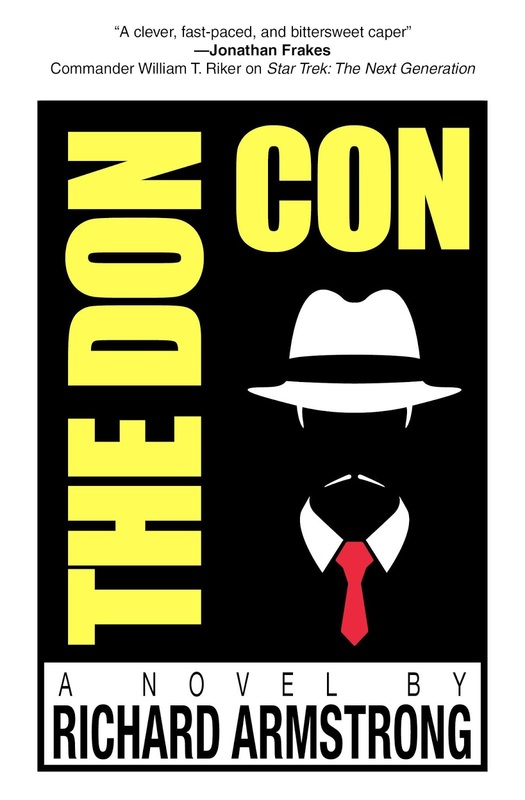 Not long after that dinner, I thought to myself, “I wonder what would happen if someone tried to steal the cash from all the celebrities at a fan convention.” And that’s how I got the idea for The Don Con! I’m still looking around for a good idea. It’s been my experience that it only takes a month or two to write a novel. But it takes about five years to come up with a good idea for one! Then once you have the idea, of course, you’ve got to work out the plot and character development. That’s where it begins to get hard. I started considering myself a professional writer from the moment I got my first check in the mail for a magazine article. That was about 40 years go. At the time I’d been working for a few years as an advertising writer. But I don’t really think you’re entitled to call yourself a “professional writer” until you’ve been published and gotten paid for it. As I mentioned, I make my living as a freelance advertising writer (also known as a “copywriter”). As a result, I’m writing or researching almost every day. I generally put in about three hours of creative work in the morning and then spend my afternoons at the local bar. No, just kidding. I spend my afternoon doing all the other tasks necessary with running a freelance copywriting business. When it comes to writing fiction, however, it’s more a matter of whether I have a good idea for a novel to work on. If I do, I usually clear the decks of my advertising work and then work on the novel very intensively until the first draft is done. If I’m in the throes of writing a novel, I can’t rest until it’s all out of my head and onto paper. So I might work up to ten hours a day on it. But writing is the easy part! The job of a novelist gets difficult when you start doing the editing, looking for an agent and/or publisher, and promoting the book. Every time I open a manuscript on my computer I give it a new number. TheDonCon5 ... TheDonCon6 ... etc. But I always skip the number 13 because it’s bad luck! In the process of writing THE DON CON, I did a lot of research into how con men operate. I found out how they sucker their victims into making foolish mistakes. How they convince their “marks” to believe things that aren’t true. How they get away with the money before their victims even know they’ve been conned. In my research, I discovered a number of of tricks and techniques—44 of them to be exact—used by con men that you can use (legally!) whenever you need to convince anybody of anything. Please go to www.thedoncon.com and download your FREE copy of How to Talk Anybody into Anything: Persuasion Secrets of the World’s Greatest Con Men now. It’s an instant free download. Thanks for being here today, Richard. 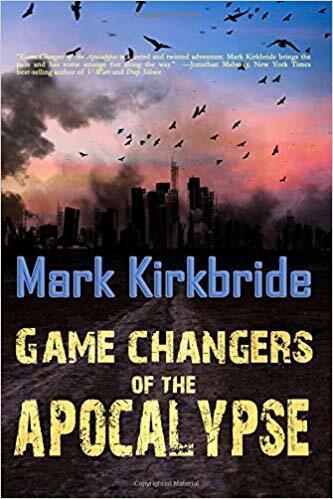 Novelist Mark Kirkbride joins me today to chat about his post-apocalyptic horror novel, Game Changers of the Apocalypse. Mark Kirkbride lives in Shepperton, England. 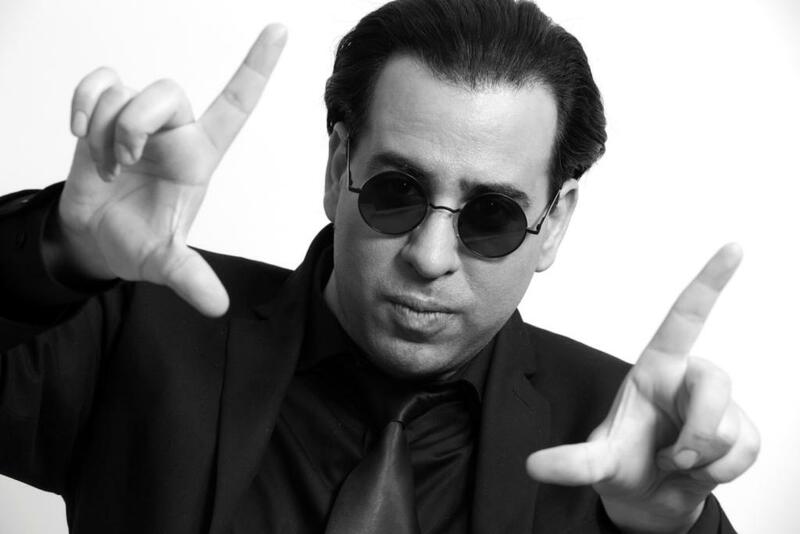 He is the author of two novels, Game Changers of the Apocalypse and Satan’s Fan Club, published by Omnium Gatherum. His short stories can be found in Under the Bed, Sci Phi Journal, Disclaimer Magazine and Flash Fiction Magazine. His poetry has appeared in the Big Issue, the Morning Star, the Mirror and Horror Writers Association chapbooks. 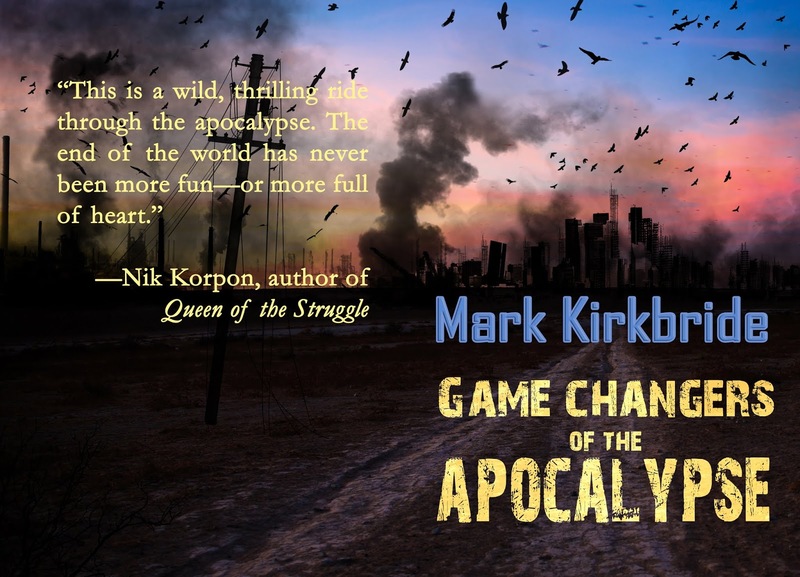 My latest novel, just out in Kindle and print, is Game Changers of the Apocalypse. It’s a post-apocalyptic horror novel. The main characters, Greg and Polly, have survived the apocalypse, yet shouldn’t have. So the universe is about to be reset to correct for the anomaly that they represent. But Greg and Polly gain access to a printer that prints drafts of the future and have a brief window to try and sidestep their fates before a new draft is completed. I had the idea one night at university – a while ago now. I wanted to write a last-man-alive novel but updated to last man and woman. It’s very much about the main characters’ relationship. The whole fate of the human race rests on them getting their relationship to work. Unfortunately, they split up the day before the world ended, and there’s an outside entity acting against them. No pressure then! Standing on paper, he leaned into the printer’s invisible heat-field. The world’s ended and I’m still coming to work... But his hunch paid off. Another manuscript filled the tray. He snatched it up, Draft 3. He flicked through its warm pages. Come on, come on, come on... Polly going off had rendered Draft 2 obsolete. Where is she? Radical action on their part could nudge fate in a different direction. Tell me. While unstable over time, short term the manuscripts’ predictions proved accurate. A clue. Something. Anything… With the right information, he could use Draft 3 against itself. Yes. It worked. He found out where she’d gone. For a moment he could see himself from the outside, clasping the manuscript – the story of their lives, written. Rearranging his grip, he noticed he’d smudged the cover page. His thumb came away with a black mark on it. The ink’s still wet. He left the manuscript on the side. There’s still time to change things, if I hurry. At the moment I’m working on a novella about a man who goes to confront God after the death of his wife. The Devil exploits his grief and he gets caught up in the eternal war between heaven and hell. I think it creeps up on you gradually. A poem here, a short story there. Probably the big milestone was getting my first novel published. But I think I’ve always been a writer by temperament. Sadly I don’t write full-time. I also work as a Subtitle Editor in London and do other little bits of freelance/commissioned work that crops up such as narrative design for a video game developer or writing quiz questions for an app developer. Everything tends to take priority over writing fiction but a lot of the best ideas arrive AFK in any case and I think I’m always writing in my head. I’m not sure how quirky this is but I can’t write anything unless I have a title to begin with – even if I end up changing it. For a long time I wanted to be a pilot. I did end up doing some flying and did enough to go solo but not enough to get a license. I sometimes think that writing is a little like flying. You take off at full throttle and try and land on the shortest runway possible. I haven’t mentioned this in public before but my grandmother died during the course of writing the book (she was 102) and, partly to stick two fingers up to death, I brought her back as a little girl at the end of it. Obviously I didn’t know her as a youngster but l like to think the character embodies a little of her spirt. 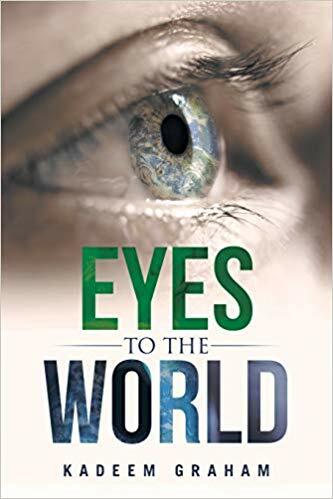 Poet Kadeem Graham joins me today to chat about a new collection of poems, Eyes to the World. Welcome, Kadeem. Please tell us a little bit about yourself. 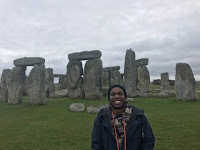 I’m a fine art student in my 2nd year with an inclination towards sculpture, I play piano, I am a voracious reader of classic literature and poetry and I have a passion for ancient history. For me, what I enjoy most about writing, is the expression of my soul into words and metaphors. It is a way of understanding the interior of my soul and an understanding of my place in the world. Also, for me is the ability to create a set of images or imagery that resonate with the emotions I feel, for example, I would compare crying and sadness to the flow of an endless river or rage and anger to the heat of a burning sun. For me this poem, is an uplifting and inspiring piece, that captures the idea of hope in the midst of our turbulent political times. The idea that everyone regardless of colour, nationality, class, background has a dream, we haven’t achieved, but we want to reach towards. This poem, is an almost apocalyptic vision of our world today, a world ravaged by environmental destruction, lawlessness, political chaos and lack of hope if we refuse to change our ways. In many ways, it is a forewarning piece of work about our uncertain future, as in the line ‘the thunder has taken a turn towards our fate’ we have created an extreme environment that is weaponized against us. This poem in it’s dark, almost gothic atmosphere it creates is one of my favourites. This was written in the winter a couple of years, when I was in deep emotional anguish. I was comparing the brutality and coldness of winter with Christmas imagery. I was feeling contradictory feelings joy at the coming of Christmas, but also sadness and hopelessness. The poem is incredibly painful, but is also very therapeutic to me. A more recent poem of mine. This poem comes from marvel, wonder, amazement and mystery at the enduring image of the night sky. As an artist and writer, the night sky is an endlessly inspiring place. In this poem, through use of imagery and metaphor, I wanted to conjure up the whimsical and almost magical quality of the stars, the moon and the night sky. I am most inspired to write in free verse, with the occasional rhyming scheme. For me, as a poet this is the most liberating exercise in being truly imaginative and creative with the scenes, images and metaphors I wish to create. I am not restricted by strict rules, I let my imagination flow. I usually write day by day, working from a word, phrase that has inspired a poem. I hope in the future, to release a collection of poetry based on love and my longstanding discussion of spirituality and faith. I first considered myself a poet, when one day I was on a journey to work and I was musing at the window looking at the sky and clouds, and I began writing how I felt about that. That inspiration lead to my first poem, The Clouds. I showed it to family and friends, and they told me it was amazing. I began to realize I could express my feelings into words about anything and everything and I used that to significant effect, I began to write more and more and the rest they say is history. Today, I write poems about my feelings and experiences and my reflections upon the world. I haven’t got too that stage just yet, I am still working on marketing myself and my work to the general public. My advice for not yet published poets, is keep writing it will greatly improve your writing ability and insights into work. Have your own unique style of writing, be different, my way of writing will be different to yours. Have a read of works by other poets. 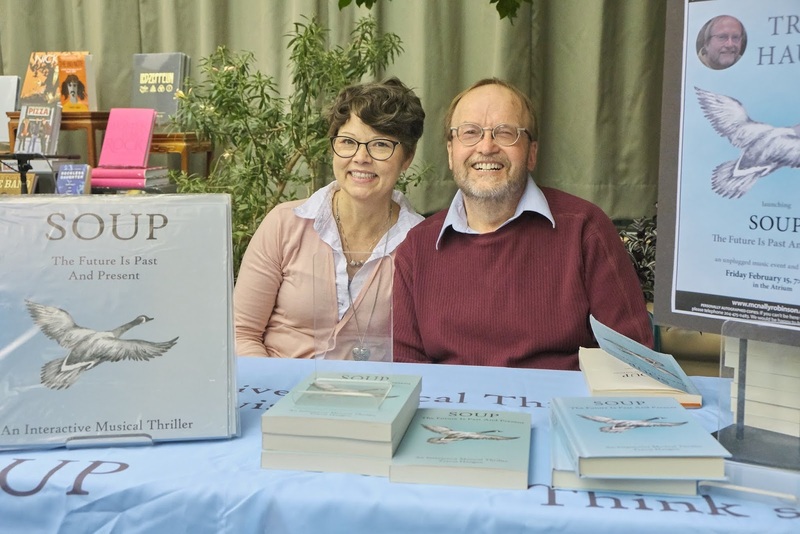 Try and get published if you can, make sure it has a great front cover and you have the rights. Publish it for yourself most of it all, for personal achievement and don’t stop writing if it doesn’t succeed. Just keep writing. I can write a poem from a verse or line that just pops into my head, like ice melting from a cloud’s shine, just thought of that now ha-ha. I wanted to do something creative, something interesting where I didn’t end working 9-5 in an office, disappearing into boredom. I am living my dream today. Have a look at a preview of my e-book on Amazon if you can and keep writing!